Built in the second century, the Theatre is able to seat 6,000 people, although comfort obviously wasn’t high up on the agenda when originally constructed. The steep stairs up to the seats of the gods were a little bit scary, but the views where exhilarating and it didn’t take much to think back to performances that might’ve been played back in Roman times. 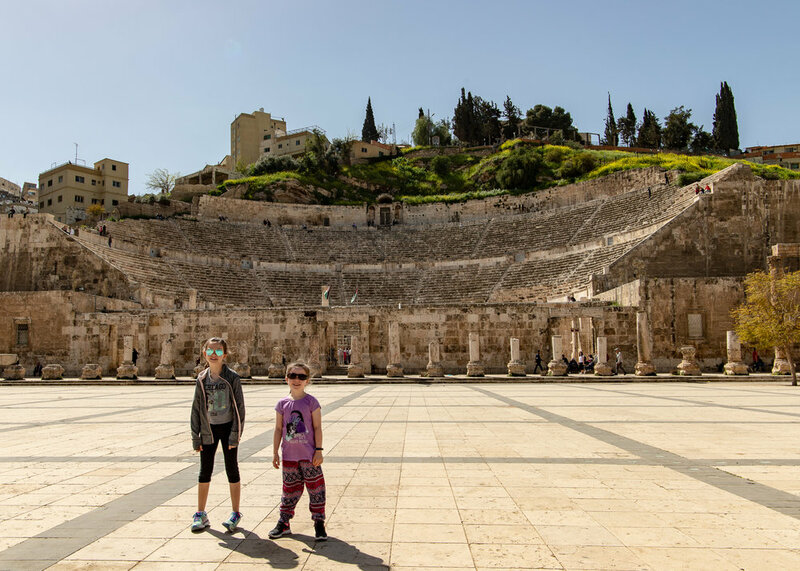 Thankfully, the only Sowerby performances were the girls doing some cartwheels on stage, after which we had a looksey through both accompanying museums on site, the Jordan Museum of Popular Tradition and Jordan Folklore Museum. Both small museums are included in price of the Theatre ticket and can be a welcome respite from the heat outside. All up we spent close to two hours on site which probably for most people would be a bit too long, but suited the pace at which we move. All the climbing left us with something of an appetite and a short walk away we stumbled across Jafra Café. With a real eclectic combination of themes going on (library, aquarium, photography and musical instruments), we weren’t too sure who it was catering for but it certainly oozed middle eastern coolness and whilst relatively quiet when we arrived, it looked like a perfect place to be when oud musicians turned up to jam. The food was top-notch across both western and Arabic dishes and extremely tasty. In fact, the pizza was the best we’d had in a long time, although Emmy said it still didn’t beat Pizza Express in Abu Dhabi. After our refuel we went in search of some Amman murals at the top of Kalha stairs. Whilst the murals weren’t that much to write home about, the cafes on the side of the stairs wowed Veronica and are definitely on the revisit list when we next come to Amman at the end of our Jordan trip. As an added bonus, there was also an extremely cheap bookshop selling a whole range of English books. Dubious authenticity and not exactly high end quality but cheap nonetheless and a good place for us to stock up for future reading lessons. From here, our next Roman destination was beckoning, so we caught a taxi to Amman’s most prominent landmark, situated up on Jabal Al Qala’a (Citadel Hill) . The Citadel is included as part of our Jordan Pass, but even visiting it without a pass, it is still dirt cheap at around 2 JD ($4.40) per adult. There are plenty of ruins scattered throughout the site which are worth exploring and all of these are easily accessible. Some of them might be a little bit too accessible! Sitting on top of the capital’s highest hill (850 metres above sea level), the citadel’s most famous sites are the Temple of Hercules and Ummayad Palace. The two massive pillars that formed part of the Temple of Hercules date back to the 2nd century AD. They certainly make for an impressive site made even more interesting by the fact that the temple, even though unfinished, was larger than any built in Rome. In the space of 200 or so steps we advanced 550 years arriving at the Ummayad Palace. The palace complex only lasted 50 years but it has left behind enough reminders of what existed, including the most impressive remains of the domed audience hall. Our visit complete, it was time to snap off just “one more photo” before walking down the hill (much easier than the uphill trek!) to take in some of the best views of the Theatre in the city. Having earnt our Roman ruins stripes, we are now well positioned to take it what Jerash has to offer.